Are you kidding?! The dog statue is the second coolest thing...the first being, obviously, the chair. I don't know. I would replace the dog statue with a lava lamp. that dog statue really tied the room together. Definitely doable! There's some good news and some bad news. Good news, some of these items still turn up on eBay. Bad news is this level of coolness isn't going to come cheap. 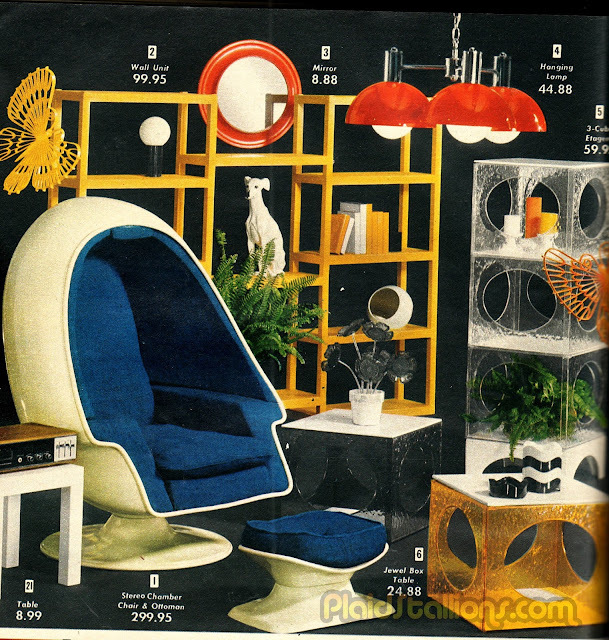 The stereo chair (with ottoman and even an end table) was a cool thousand. Run a completed auction search for eBay number:322730525640 or the completed auctions of eBay seller: davigran_7. It's worth contacting the seller and see if they have any additional info where they bought it etc. Might be some out of the way furniture store still has a dust-covered box sitting in the storage room, or some instruction/ assembly manuals. This was the room where No. 2 unwound. It was located under his main meeting room where he would accost No. 6. It is true, this stuff is rare and pricey today.I know a dealer that used to specialize in this stuff, but gave it up because no one could afford it.I also know through experience that this stuff was fragile, even when new,so today it would be strictly for display, not for my 6' 2" 240 lb. frame. Who is the manufacturer of that chair?